Department of Biosciences, Bapalal Vaidya Botanical Research Centre, Veer Narmad South Gujarat University, Surat - 395007, Gujarat, India. ABSTRACT: Plants have been studied since ages for their therapeutic uses. In the earlier time, not much was known about the phytocompounds, but today the constituents of the different plants have been extracted and isolated for the use in the name of medicines or drugs. Flavonoid is one of the most characteristic classes’ of compounds in higher plants known to play several important roles including therapeutic uses in cancer treatment. The activation of oncogenes in the cancer cells can be regulated by the selective tyrosine kinases inhibitors, and therefore it can be considered as a promising approach for the targeted therapeutic development. Hence, in the present study, the authors tried to combine the knowledge of using plant Launaea procumbens in traditional medicine by analyzing and identifying the specific phytocompounds, especially flavonoids, and evaluating its anticancer potential. The scope of the present study is based on the aim to determine the possible use of plant Launaea procumbens in the field of therapeutics for cancer studies by performing in-silico docking analysis of isolated flavonoid compound on Tyrosine-protein kinase Fyn in comparison to Methotrexate, Imatinib, Clofarabine, and Daunorubicin. Based on the molecular drugs docking and binding affinities of the target proteins with an isolated flavonoid constituent from the plant, and its physicochemical detailing, it was found that the isolated flavonoid constituent has high possibilities to be an anticancer drug if utilized further with systematic approaches. INTRODUCTION: Plants have been studied since ages for their therapeutic uses. In the earlier time, not much was known about the phytocompounds but beliefs set to be used as the life-saving remedy. While today the constituents of the different plants have been extracted and isolated for the same use in the name of medicines or drugs 1. Several diseases such as malaria, diarrhea, dysentery, bacterial and fungal infections, epilepsy and many more have been managed traditionally using the medicinal plants 2, 3. The scope of using plants in the treatment of cancer is also now reported in many parts with versatile phyto-compounds 4-10. Herbal medication in general, therefore, was applied as a combination therapy with the conventional chemotherapy to increase the therapeutic benefit and quality of life hopefully as well as to decrease the side effects or complications 11, 12. The plant Launaea procumbens belongs to the family Asteraceae and traditionally used as folk medicine in the treatment of rheumatism, kidney and liver dysfunctions, skin diseases, dysentery and eye diseases 13. The use of the plant in cytotoxic evaluations has also been reported and showed the anticancer activity against Leukemia, Cervical Cancer, Pancreatic Cancer and Breast Cancer 14. Cancer has diverse classifying approaches, and one of them is including Sarcoma and Carcinoma. Carcinoma is considered a malignant tumor originating from the epithelial cells, while sarcoma is cancer that arises from transformed cells of mesenchymal origin. It refers to cancer that originates in supportive and connective tissues such as bones, tendons, cartilage, muscle and fat 15. In 1911, Francis Peyton Rous purified a substance from chickens that were later shown to be a sarcoma-causing virus (Rous sarcoma virus), and the responsible oncogene was called v-Src 16, 17. Later, in 1976, J. M. Bishop and H. E. Varmus discovered a related gene in chickens, which showed a striking resemblance to v-Src and this normal cellular counterpart, called cellular Src or c-Src or Src was the first proto-oncogene to be identified 17, 18. Src belongs to a family of nonreceptor tyrosine kinases that includes nine members divided into 3 sub-families. The first subfamily, SrcA, includes Src, Yes, Fyn and Fgr; the second subfamily, SrcB, includes Lck, Hck, Blk and Lyn; while the third subfamily is composed of Frk in its own subfamily 19. Tyrosine kinases are important mediators of signal transduction process in the cell, leading to cell proliferation, differentiation, migration, metabolism and programmed cell death 20-23. The Fyn member of the Src family is ubiquitously expressed and known to function in T-cell signaling and differentiation 24, 25, entry into mitosis 26 and cell adhesion 27. It has also been reported using the cell lines model of blast crisis CML, that over-expression of constitutively active Fyn caused increased aneuploidy and genomic alterations, suggesting that a balance of Fyn expression and activity exist to regulate cell growth 28. Reviews on the Fyn reports that pharmacologic developments of Src family kinases inhibitors have focused upon inhibition of c-Src rather than other Src family kinases that may be more relevant to human diseases such as Fyn 29. Hence, in the present study, authors tried to combine the knowledge of using Launaea procumbens in traditional medicine by analyzing and identifying the specific phyto-compounds, especially flavonoids, and evaluating its anticancer potential by in-silico molecular docking studies. Collection of Samples: Fresh plants were collected from, Shree Bapalal Vaidhya Botanical Garden, located in the Veer Narmad South Gujarat University Campus, Udhna Magdalla Road, Surat, Gujarat, India. Taxonomic identities of the plant were confirmed by the Taxonomists in Department of Biosciences, Veer Narmad South Gujarat University, Surat, Gujarat, India, and the specimen voucher collection were preserved in the herbarium of the Department vide herbarium no. The leaves from the plants were separated, washed under the running tap water and dried at 45 °C in the oven. The dried leaves were then homogenized to a fine powder and stored in the airtight container for future use. Isolation of Flavonoids and Characterization: Methanolic extract of the stored powdered plant material was prepared according to the procedure stated by Mishra et al., 2012 30, and was subjected to initial screening of flavonoids through the thin layer chromatography 31. After successful formation of a clear band of flavonoid and identification through chemical analysis, the preparative high-performance thin layer chromatography was performed and the minute proportion of the flavonoid component was collected 30. The isolated component of the fraction was assigned with code FRC1 and analyzed further using UV-Vis Spectrophotometer showing single peak 30. The confirmation of single compound believed to be from the family of flavonoids was done by the IR Spectroscopy, and then the fraction was sent for GC-MS analysis at Central Salt and Marine Chemical Research Institute (CSMCRI), Bhavnagar, Gujarat, India. 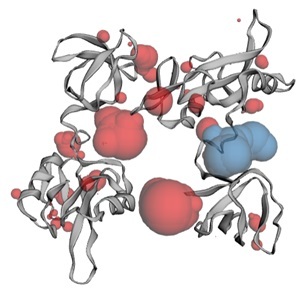 Retrieval of Protein and Ligand Structures from Database for Molecular Docking Analysis: The three dimensional structures of protein, playing an important role in cancer development namely Tyrosine-protein kinase Fyn was retrieved from Research Collaboratory for Structural Bioinformatics Protein Data Bank (http://www. rcsb.org/pdb/home/home.do), with the PDB ID: 1G83. The identified flavonoid FRC-1 was searched on the chemical database, and three dimensional structure of the compound was downloaded from the PubChem website with id CID546821 (https://pubchem.ncbi.nlm.nih.gov/compound), while the other known compounds reported being used in cancer therapy viz., Methotrexate with id; DB00563, Imatinib with id; DB00619, Clofarabine with id; DB00631 and Daunorubicin with id; DB00694 were downloaded from Drugbank website (https://www.drugbank.ca/drugs). Analysis of Physicochemical Properties: The physicochemical descriptions of all the compounds as well as ADME parameters were analyzed using SwissADME web tool 32, developed and maintained by the Molecular Modeling Group of the Swiss Institute of Bioinformatics (SIB) (http://www.swissadme.ch/index.php). While the physicochemical properties of protein were evaluated and compared using the ExPASy’s Prot-Param tool (https://web.expasy.org/protparam/). Preparation of Protein and Ligand Structure: The PDB protein structure and ligand structures were processed with the Protein Preparation Wizard and LigPrep tools in the Schrodinger suite respectively 33. All the interacting heavy atoms, crystallographic water molecules, other unwanted ligand, metal ions are removed and added with hydrogen atoms using Schrodinger suite. Then, the protein was subjected to energy minimization, and on the final stage, addition of hydrogen atoms to the target protein molecule before docking was performed 34. 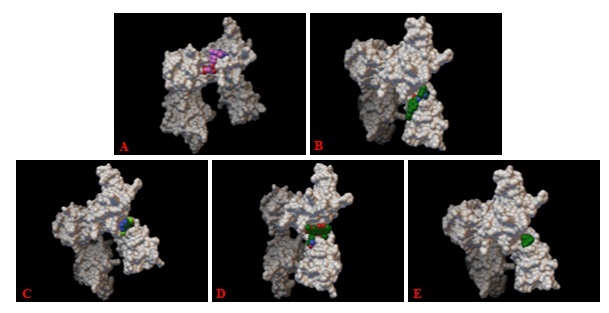 Analysis of Target Active Binding Sites: Active binding site pockets of target protein were identified using CASTp (Computed Atlas of Surface Topography of proteins) server (http://sts.bioe.uic. edu/castp/calculation.html) 35. CASTp is used to verify the ligand binding sites of a protein, and it includes annotated functional information of specific residues on the protein structure 36, 37. Molecular Docking Analysis: Docking analysis of target protein and ligands were done using the online program PatchDock 38, 39. The PDB format of both proteins and ligands was sent to PatchDock server for docking (http://bioinfo3d.cs.tau.ac.il/ PatchDock/) maintaining clustering RMSD at default 4.0 and complex type as default. Conformational analysis of docking was also performed using AutoDock Vina as stated by Rauf et al., 2015 40 and macromolecules were docked separately with the ligand molecules in AutoDock Vina 41, 42. 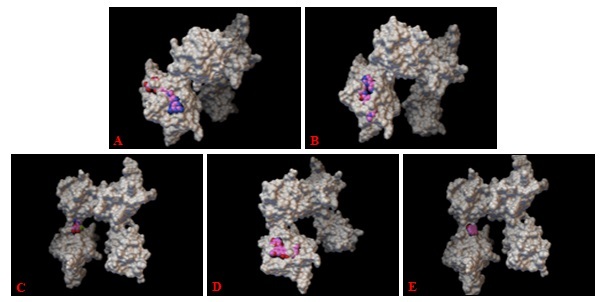 Detailed visualization and comparison of the docked sites of target proteins and ligands were done by PyMol 43. Isolation of Flavonoid Constituent and Characterization: The presence of flavonoid constituent in the leaf extract of Launaea procumbens was confirmed using the procedure and protocol-stated by Mishra et al., 2014 31. Further isolation and confirmation of the isolation of flavonoid constituent were done using the procedure stated by Mishra et al., 2012 30. The FRC-1 component collected by the preparative HPTLC process was then subjected for the identification of component present in it. The fraction was sent to CSMCRI lab at Bhavnagar for GC-MS analysis and revealed one major peak with two minor peaks. The major peak constitutes of 80.03% area with retention time at 17.985, and the IUPAC name of the compound was interpreted as “1, 4-Epoxy-naphthalene-1(2H)-methanol, 4, 5, 7-tris (1, 1-dimethyl)-3,4 dihydro” from the library search. The compound was searched on various chemical databases for structure identification and found on PubChem Database with ID: CID546821 (https:// pubchem.ncbi.nlm.nih.gov/compound/546821). Analysis of Physicochemical Properties: In this present study, the interactions between the tyrosine protein kinase Fyn (target) with FRC-1 and standard drugs (Ligands) was studied to explore their binding mode. Docking study was performed using the online program PatchDock. Tyrosine-protein kinase Fyn (PDB ID: 1G83) structure was derived from RCSB Protein Data Bank and used as a target for docking simulation. The physicochemical details and pharmacokinetic properties of FRC-1 and standard drugs (Methotrexate with id; DB00563, Imatinib with id; DB00619, Clofarabine with id; DB00631 and Daunorubicin with id; DB00694) are mentioned in Table 1 and Table 2 respectively. The 3D structure of protein and ligands were visualized using PMV tool by MGL 44 and Rasmol as shown in Fig. 1 and Fig. 2 respectively. All the physicochemical properties of target proteins were calculated using the ExPASy’s ProtParam web tool Table 3. The parameters computed by ProtParam include the molecular weight, theoretical pI, amino acid composition, atomic composition, extinction coefficient, estimated half-life, instability index, aliphatic index and grand average of hydropathicity (GRAVY). Molecular weight and theoretical pI are calculated as in Compute pI/Mw 45. Analysis of Target Protein Active Sites: Analysis of protein structures for binding site pockets is important and often the starting point considered in the protein-ligand docking studies. In the present study, the CASTp server is used to identify the possible active binding sites for the ligand in the tyrosine protein kinase Fyn. CASTp server predicted 37 active sites of the target protein. The area computed for the pocket 1 is the largest with a value of 230.239 and volume with a value of 250.224. Pocket 1 being the largest is comprising of 18 amino acid residues viz., VAL88, ALA89, LEU90, TYR91, LYS105, GLY106, ASN136, VAL138, ALA139, GLN145, ALA146, GLU147, GLU148, TYR150, PHE151, GLY152, LYS153, and GLU177, is shown with blue color while others with red color in the Fig. 3. 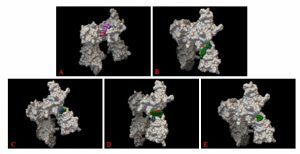 Molecular Docking Analysis: The goal of ligand-protein docking is to predict the predominant binding model(s) of a ligand with a protein of known 3D structures 46. 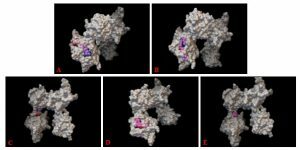 To study the binding mode of FRC-1 in the binding site of Tyrosine-protein kinase Fyn, docking studies were performed, and energy values were calculated from the docked conformations of the protein-inhibitor complexes. The target protein with FRC-1 and known compounds viz., Methotrexate (DB00563), Imatinib (DB00619), Clofarabine (DB00631) and Daunorubicin (DB00694), was docked using an automated molecular docking server PatchDock in order to find out how the chemical compounds inhibit the target proteins structure based on the negative binding affinity values 47 as shown in Table 4. Docking studies yielded crucial information concerning the orientation of the inhibitors in the binding pocket of the target protein. The minimum binding energy indicated that the Tyrosine-protein kinase Fyn was successfully docked with FRC-1 as showed in Table 4. Further confirmation of the docking was also carried out using Autodock Vina tool and results confirmed the PatchDock results, showing successful binding of FRC-1 with the Tyrosine-protein kinase Fyn target protein Table 5. The molecular docking results clearly show that the binding affinity of FRC-1 with target protein is very good. PatchDock results show that the binding value of FRC-1 with 1g83, is -329.01 which is very good for a compound to show binding conformation with that protein Table 4. While comparing the binding affinity of FRC-1 with other compounds, it should not be overlooked that the other compounds are much bigger than compared to FRC-1 and therefore may give a higher binding affinity value. Although, it is very much clear from the PatchDock results that, the binding affinity value of FRC-1 is much better in context to the potent drug inhibitor of 1g83, further confirmations of docking score is carried out. The confirmation of docking scoring is therefore carried out by AutoDock Vina, and the results also supported PatchDock output. Moreover, FRC-1 determines to be the most prominent compound giving the highest binding affinity values with tyrosine protein kinase Fyn Table 5. Finally as the FRC-1 shows most promising high negatively binding values than compared to Methotrexate (DB00563), Imatinib (DB00619), Clofarabine (DB00631) and Daunorubicin (DB00694), and also the successful binding of compounds to the target proteins pockets Fig. 4 and Fig. 5, it can be considered as one potential inhibitor of Tyrosine-protein kinase Fyn. CONCLUSION: In the present in-silico investigation, we elucidated one finding that the flavonoid compound (FRC-1) which is isolated and identified from the plant (Launaea procumbens) acted as potential anticancer agent for the target protein, Tyrosine-protein kinase Fyn. Analysis of ligand binding interaction with the target proteins can be useful for new preventive and therapeutic drug for cancer. Based on the molecular drugs docking and binding affinities of the target protein with FRC-1 and its physicochemical detailing, it was found that the flavonoid, FRC-1, has high possibilities to be an anti-cancer drug if utilized further with systematic approaches. The results obtained from this study would be useful in both understanding the inhibitory mode as well as in rapidly and accurately predicting the activities of new inhibitors by docking scores to narrow down and finalize the lead compounds. The results are also helpful for the design and development of novel drug having better inhibitory activity against various types of cancer. Finally, from this study, we conclude that plant Launaea procumbens contains a very remarkable phytocompound (FRC-1). This compound shows a significant and very high potential in anticancer property in in-silico studies and therefore can be one of the possible compound to provide anticancer property to plant for which it is used as traditional herbal medicine in leukemia. This potential drug candidate can, therefore, be further validated in wet lab studies for its proper function. ACKNOWLEDGEMENT: The authors highly acknowledge the support and facilities provided by the Department of Biosciences, Veer Narmad South Gujarat University, Surat for the entire research program. CONFLICT OF INTEREST: Authors report there is no conflict of interest in the present study. Iwu MM: Therapeutic agents from ethnomedicine. In M. M. Iwu, & J. C. Worton, Ethnomedicine and drug discovery 2002. Sofowara A: Medicinal plants and traditional medicines in Africa. Nigeria: John Wiley and Sons Ltd., 1982. Sofowara A: Research on medicinal plants and traditional medicine in Africa. Journal of Alternative and Complementary Medicine 1986; 2(3): 365-372. Cornwell T, Cohick W and Raskin I: Dietary phytoestrogens and health. Phytochemistry 2004; 65: 995-1016. Dixon RA: Phytoestrogen. Annual Reviews of Plant Biology 2004; 55: 225-261. Greenwald P: Clinical trials in cancer prevention: Current results and perspectives for the future. The Journal of Nutrition 2004; 134(12): 3507-3512. Holzbeierlein J, McIntosh M and Thrasher JB: The role of soy phytoestrogens in prostate cancer. Current Opinion in Urology 2005; 15: 17-22. Magee PJ and Rowland IR: Phytoestrogens, their mechanism of action: Current evidence for a role in breast and prostate cancer. Brazilian Journal of Nutrition 2004; 91: 513-531. Adelcreutz H: Phytoestrogens and cancer. The Lancet Oncology 2002; 3: 32-40. Guo JY, Li X and Browning JD: Dietary soy isoflavones and estrone protect ovariectomized ERalphaKO ad wild type mice from carcinogen-induced colon cancer. The Journal of Nutrition 2004; 134: 179-182. Ferro MA, Leis A, Doll R, Chiu L, Chung M and Barroetavena M: The impact of acculturation on the use of traditional Chinese medicine in newly diagnosed Chinese cancer patients. Supportive Care in Cancer 2007; 15(8): 985-992. Maskarinec G, Shumay DM, Kakai H and Gotay CC: Ethnic differences in complementary and alternative medicine use among cancer patients. Journal of Alternative and Complementary Medicine 2000; 6(6): 531-538. El-Bassuony AA and Abdel-Hamid NM: Antibacterial coumarins isolated from Launaea resedifolia. Chemistry of plant raw materials. Химия растительного сырья 2006; 1: 65-68. Rawat P, Saroj LM, Kumar A, Singh TD, Tewari SK and Pal M: Phytochemicals and cytotoxicity of Launaea procumbens on human cancer cell lines. Pharmacognosy Magazine 2016; 12(4): 5431-5435. Rous P: A sarcoma of the fowl transmissible by an agent separable from the tumor cells. The Journal of Experimental Medicine 1911; 13: 397-411. Stehelin D, Fujita DJ and Padgett T: Detection and enumeration of transformation defective strains of avian sarcoma virus with molecular hybridization. Virology 1977; 76(2): 675-684. Sen B and Johnson FM: Regulation of Src family kinases in human cancer. Journal of Signal Transduction 2011. Parsons SJ and Parsons JT: Src family kinases, key regulators of signal transduction. Oncogene 2004; 23(48): 7906-7909. Hunter T: Signaling-2000 and beyond. Cell 2000; 100: 113-127. Schlessinger J: Cell signaling by receptor tyrosine kinases. Cell 2000; 103: 211-225. Blume-Jensen P and Hunter, T: Oncogenic kinase signaling. Nature 2001; 411: 355-365. Paul MK and Mukhopadhyay AK: Tyrosine kinase - Role and significance in cancer. International Journal of Medical Science 2004; 1: 101-115. Palacios EH and Weiss A: Function of the Src-family kinases, Lck and Fyn, in T-cell development and activation. Oncogene 2004; 23: 7990-8000. Zamoyska R, Basson A, Filby A, Legname G and Lovatt M: The influence of the Src-family kinases, Lck and Fyn, on T-cell differentiation, survival and activation. Immunology Reviews 2003; 191: 107-118. Roche S, Fumagalli S and Courtneidge SA: Requirement for Src family protein tyrosine kinases in G2 for fibroblast cell division. Science 1995; 269: 1567-1569. Resh MD: Fyn, an Src family tyrosine kinase. Inter Journal of Biochem and Cell Biology 1998; 30: 1159-1162. Singh MM, Howard A, Irwin ME, Gao Y, Lu X and Multani A: Expression and activity of Fyn mediate proliferation and blastic features of Chronic Myelogenous Leukemia. PLoS One 2012; 7(12). Saito YD, Jensen AR, Salgia R and Posadas EM: Fyn - A novel molecular target in cancer. Cancer 2010; 1629-1637. Mishra GJ, Reddy MN and Rana JS: Isolation of flavonoid constituent from Launaea procumbens Roxb by preparative HPTLC method. IOSR Journal of Pharmacy 2012; 2(4): 5-11. Mishra GJ, Rana JS, Gadhvi R and Reddy MN: Identification of total phenolics, total flavonoids and antioxidant potential in the leaf extracts of Launaea procumbens International Journal of Pharmaceutical Research Scholars 2014; 3(1): 374-381. Daina A, Michielin O and Zoete V: SwissADME: A free web tool to evaluate the pharmacokinetics, drug-likeness and medicinal chemistry friendliness of small molecules. Scientific Reports 2017; 7: 42717. Schrodinger: Schrodinger Suite 2018-1, Protein preparation wizard: Epik. Schrodinger, LLC, New York, NY 2016. Sastry GM, Adzhigirey M, Day T, Annabhimoju R and Sherman W: Protein and ligand preparation: Parameters, protocols and influence on virtual screening enrichments. 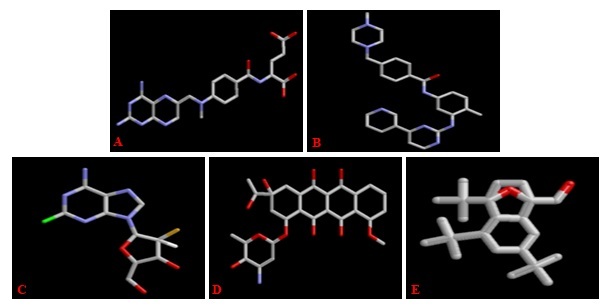 Journal of Computer-Aided Molecular Design 2013; 27(3): 221-234. Joe D, Zheng O, Jeffery T, Andrew B, Yaron T and Jie L: CASTp: computed atlas of surface topography of proteins with structural and topographical mapping of functionally annotated residues. Nucleic Acid Research 2006; 34: W116-W118. Liang J, Edelsbruner H and Woodward C: Anatomy of proteins pockets and cavities: measurement of binding sites geometry and implications for ligand design. Protein Science 1998; 7: 1884-1897. Prajapati C and Reddy MN: Molecular docking studies of can thin-6-one from Simarouba glauca against EGFR tyrosine kinase. International Journal of Pharmaceutical Sciences and Research 2017; 8(12): 5130-5136. Schneidman DD, Inbar Y, Nussinov R and Wolfson HJ: PatchDock and SymmDock: Servers for rigid and symmetric docking. Nucleic Acid Research 2005; 33: W363-W367. Rauf MA, Zubair S and Azhar A: Ligand docking and binding site analysis with pymol and autodock/vina. International Journal of Basic and Applied Sciences 2015; 4(2): 168-177. Trott O and Olson AJ: AutoDock Vina: Improving the speed and accuracy of docking with a new scoring function, efficient optimization and Journal of Computational Chemistry 2010; 31: 455-461. Bhatt MH, Prajapati CK and Reddy MN: In-silico docking studies of Lupeol with MAPK pathway proteins - Raf 1, MEK & ERK. Journal of Experimental Therapeutics and Oncology 2017; 12: 137-140. DeLano WL: The PyMOL molecular graphics system. (2002). San Carlos, CA 2009. Michel F: Python: A programming language for software integration and development. Journal of Molecular Graphics 1999; 17: 57-61. Gasteiger E, Hoogland C, Gattiker A, Duvaud S, Wilkins MR and Appel RD: Protein identification and analysis tools on the ExPASy server. In J. M. Walker, The Proteomics Protocols Handbook (pp. 571-607). Humana Press 2005. Mittal RR, McKinnon RA and Sorich MJ: Comparison data sets for benchmarking QSAR methodologies in lead optimization. Journal of Chemical Information and Modelling 2009; 49: 1810-1820. Mashiach E, Schneidman DD, Peri A, Shavit Y, Nussinov R and Wolfson HJ: An integrated suite of fast docking algorithms. Proteins 2010; 78: 3197-3204. Mishra GJ, Prajapati C, Patel M and Reddy MN: Comparative molecular docking analysis of flavonoid component from Launaea procumbens (roxb.) against tyrosine protein kinase Fyn. Int J Pharm Sci & Res 2019; 10(2): 537-45. doi: 10.13040/IJPSR.0975-8232. 10(2).537-45. Authors Address: Department of Biosciences, Bapalal Vaidya Botanical Research Centre, Veer Narmad South Gujarat University, Surat, Gujarat, India.